Heat the oven to 450°. Put the bread on a baking sheet and toast until lightly browned, turning once, about 5 minutes. In a large frying pan, cook the bacon over moderate heat until crisp. Remove the bacon with a slotted spoon and drain on paper towels. Add the onions to the bacon fat and cook over moderate heat, stirring occasionally, until translucent, about 5 minutes. Add 2 tablespoons of the vinegar, the beans, 3/4 teaspoon of the salt, and 1/2 teaspoon of the pepper. Mix gently and remove from the heat. Put the spinach in a large glass or stainless-steel bowl. Add the remaining tablespoon of vinegar and 1/2 teaspoon each of salt and pepper, the oil, and the bacon to the bowl and toss. Stir half of the bean mixture into the spinach and put the salad on plates. 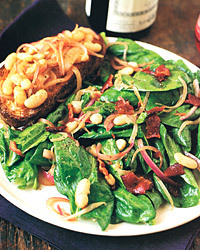 Top each slice of toasted bread with the remaining bean mixture and serve with the salad. The complex combination of flavors and textures in this salad is best accompanied by a simple, crisp, and fruity red wine for contrast. Beaujolais would be our first choice, but Valpolicella, Bardolino, or even a Provençal rosé will work as well.